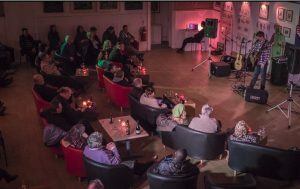 CICCIC’s Open Mic Night will now be hosted by Gordon Campbell & Su Mo who welcome you, the audience and performers to showcase ideas / pieces / songs / poems/ comedy theatre / music etc! Performers simply book a slot on this website or by calling the venue or Gordon direct at 07966 200058. No entry fees for both audience and performers. The CICCIC is a favourite for performers with a listening audience with seating arranged facing the stage area. Get yourself tuned up, try and learn your lines or lyrics, get yourself stage ready for our open mic and a testing audience.